over temptation to wrongly suffer punishment in prison? Meanwhile, Joseph with his captors was on the way to Egypt. As the caravan journeyed southward toward the borders of Canaan, the boy could discern in the distance the hills among which lay his father's tents. Bitterly he wept at thought of that loving father in his loneliness and affliction. Again the scene at Dothan came up before him. He saw his angry brothers and felt their fierce glances bent upon him. The stinging, insulting words that had met his agonized entreaties were ringing in his ears. With a trembling heart he looked forward to the future. What a change in situation—from the tenderly cherished son to the despised and helpless slave! Alone and friendless, what would be his lot in the strange land to which he was going? For a time Joseph gave himself up to uncontrolled grief and terror. Then his thoughts turned to his father's God. In his childhood he had been taught to love and fear Him. Often in his father's tent he had listened to the story of the vision that Jacob saw as he fled from his home an exile and a fugitive. He had been told of the Lord's promises to Jacob, and how they had been fulfilled—how, in the hour of need, the angels of God had come [p. 214] to instruct, comfort, and protect him. And he had learned of the love of God in providing for men a Redeemer. Now all these precious lessons came vividly before him. Joseph believed that the God of his fathers would be his God. He then and there gave himself fully to the Lord, and he prayed that the Keeper of Israel would be with him in the land of his exile. His soul thrilled with the high resolve to prove himself true to God—under all circumstances to act as became a subject of the King of heaven. He would serve the Lord with undivided heart; he would meet the trials of his lot with fortitude and perform every duty with fidelity. One day's experience had been the turning point in Joseph's life. Its terrible calamity had transformed him from a petted child to a man, thoughtful, courageous, and self-possessed. The marked prosperity which attended everything placed under Joseph's care was not the result of a direct miracle; but his industry, care, and energy were crowned with the divine blessing. Joseph attributed his success to the favor of God, and even his idolatrous master accepted this as the secret of his unparalleled [p. 217] prosperity. Without steadfast, well-directed effort, however, success could never have been attained. God was glorified by the faithfulness of His servant. It was His purpose that in purity and uprightness the believer in God should appear in marked contrast to the worshipers of idols—that thus the light of heavenly grace might shine forth amid the darkness of heathenism. Joseph's gentleness and fidelity won the heart of the chief captain, who came to regard him as a son rather than a slave. The youth was brought in contact with men of rank and learning, and he acquired a knowledge of science, of languages, and of affairs—an education needful to the future prime minister of Egypt. But Joseph's faith and integrity were to be tested by fiery trials. His master's wife endeavored to entice the young man to transgress the law of God. Heretofore he had remained untainted by the corruption teeming in that heathen land; but this temptation, so sudden, so strong, so seductive—how should it be met? Joseph knew well what would be the consequence of resistance. On the one hand were concealment, favor, and rewards; on the other, disgrace, imprisonment, perhaps death. His whole future life depended upon the decision of the moment. Would principle triumph? Would Joseph still be true to God? With inexpressible anxiety, angels looked upon the scene. Joseph's answer reveals the power of religious principle. He would not betray the confidence of his master on earth, and, whatever the consequences, he would be true to his Master in heaven. Under the inspecting eye of God and holy angels many take liberties of which they would not be guilty in the presence of their fellow men, but Joseph's first thought was of God. "How can I do this great wickedness, and sin against God?" he said. If we were to cherish an habitual impression that God sees and hears all that we do and say and keeps a faithful record of our words and actions, and that we must meet it all, we would fear to sin. Let the young ever remember that wherever they are, and whatever they do, they are in the presence of God. No part of our conduct escapes observation. We cannot hide our ways from the Most High. Human laws, though sometimes severe, are often transgressed without detection, and hence with impunity. But not so with the law of God. The deepest midnight is no cover for the guilty one. He may think himself alone, but to [p. 218] every deed there is an unseen witness. The very motives of his heart are open to divine inspection. Every act, every word, every thought, is as distinctly marked as though there were only one person in the whole world, and the attention of heaven were centered upon him. "The dream of Pharaoh is one," said Joseph. "God hath showed Pharaoh what He is about to do." There were to be seven years of great plenty. Field and garden would yield more abundantly than ever before. And this period was to be followed by seven years of famine. "And the plenty shall not be known in the land by reason of that famine following; for it shall be very grievous." The repetition of the dream was evidence both of the certainty and nearness of the fulfillment. "Now therefore," he continued, "let Pharaoh look out a man discreet and wise, and set him over the land of Egypt. Let Pharaoh do this, and let him appoint officers over the land, and take up the fifth part of the [p. 221] land of Egypt in the seven plenteous years. And let them gather all the food of those good years that come, and lay up corn under the hand of Pharaoh, and let them keep food in the cities. And that food shall be for store to the land against the seven years of famine." 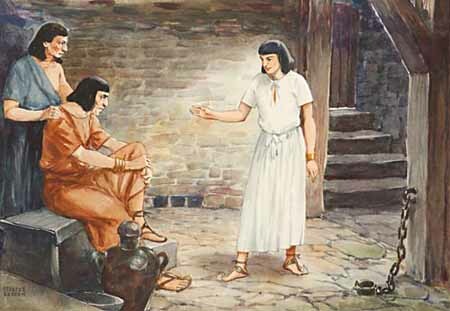 How was Joseph enabled to make such a record of firmness of character, uprightness, and wisdom?—In his early years he had consulted duty rather than inclination; and the integrity, the simple trust, the noble nature, of the youth bore fruit in the deeds of the man. A pure and simple life had favored the vigorous development of both physical and intellectual powers. Communion with God through His works and the contemplation of the grand truths entrusted to the inheritors of faith had elevated and ennobled his spiritual nature, broadening and strengthening the mind as no other study could do. Faithful attention to duty in every station, from the lowliest to the most exalted, had been training every power for its highest service. He who lives in accordance with the Creator's will is securing to himself the truest and noblest development of character. "The fear of the Lord, that is wisdom; and to depart from evil is understanding." Job 28:28. There are few who realize the influence of the little things of life upon the development of character. Nothing with which we have to do is really small. The varied circumstances that we meet [p. 223] day by day are designed to test our faithfulness and to qualify us for greater trusts. By adherence to principle in the transactions of ordinary life, the mind becomes accustomed to hold the claims of duty above those of pleasure and inclination. Minds thus disciplined are not wavering between right and wrong, like the reed trembling in the wind; they are loyal to duty because they have trained themselves to habits of fidelity and truth. By faithfulness in that which is least they acquire strength to be faithful in greater matters. Click here to read the next chapter: "Joseph and His Brothers"